I think interior design is sort of like a love language for me. I'm not always the best mom, I don't make every meal from scratch, and sometimes work means that I don't get as much time with them each day that I'd love to. But when I design fun and pretty spaces for my kids, they always have a little piece of my heart with them even when I'm not, whether they're in their playroom with their babysitter, or down for a nap in their bedrooms. This is my way of giving of my time and energy to them-- my gift of service. There is something so special about having a baby girl. Whether it's because she's my girl or just because she's my baby, I'm not entirely sure, but her brother is getting so big and independent that it's hard to think of him as my baby anymore. But she is my sweet baby girl. I have so much fun dressing her, buying her sweet little earrings, and combing her soft wisps of hair into little pigtails. I love that she tries to put bows in her own hair and says "pretty" when she successfully balances it on top of her head so that it doesn't fall off. Every time I hear her sweet little voice, I smile. Those are the things that matter. Our relationship and those sweet moments that only we get to share. I write about the design elements in this room, not because it's perfect or because these material things are important. I do enjoy decorating and seek out blog posts like this to gain ideas from other like-minded moms and designers. 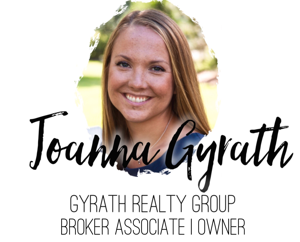 I also feel called to use this platform that I have in this blog to support small businesses and shine a little light on some really great hand-made products, so I'll talk about those more than some others you might see in the photos. 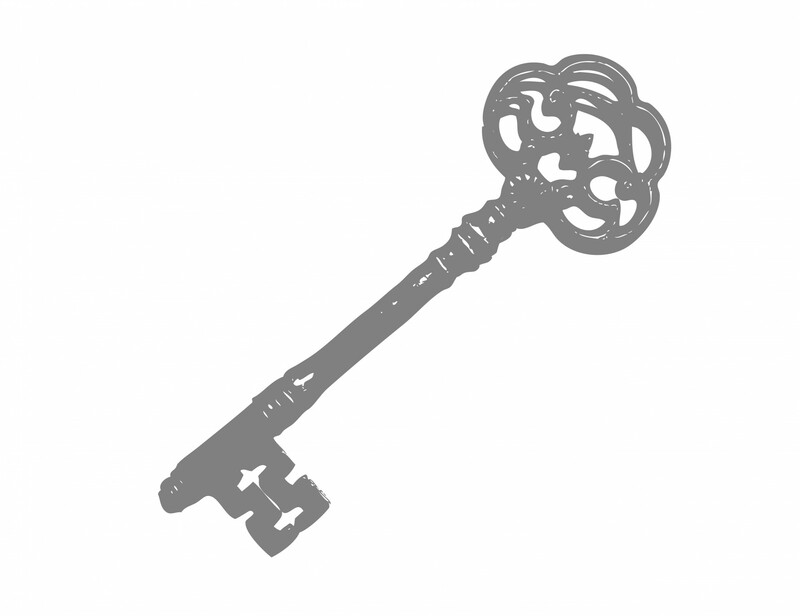 If you've been reading my blog for any length of time, you know that I'm a little obsessed with etsy and supporting artisans and their little shops. My favorite elements in this room are no exception. There was no way any girl of mine wasn't going to have a pink room from floor to ceiling, but I wanted a strong accent color that would add a bit of a modern edge to the space. I love navy, and while it was somewhat of a challenge to find navy pieces that worked with pink or included both hues, at the end of the day I'm very happy with how it turned out. The biggest project was paint. I selected a light pink for the walls, with one accent wall having subtle stripes in alternating glossy and matte paint finishes- a very subtle effect that didn't show up in most of the photos. 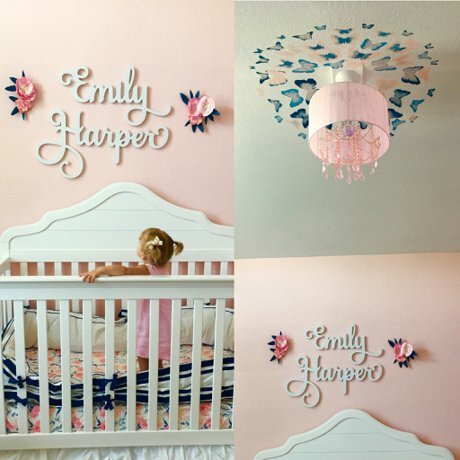 I used the same pink, along with some left over navy paint from her brother's room to stencil a butterfly medallion on the ceiling around her sweet little pink chandelier. This was the first time I've attempted a two-tone effect with a stencil, which I was inspired to do after seeing some great tutorials on the Cutting Edge Stencil's blog, although I've worked with their wall stencils on several other projects and love how easy they are to use. When I was little I shared a room with my sister, Molly. While so many things have changed since then, the fact that she is an incredible artist isn't one of them, because she always has been. 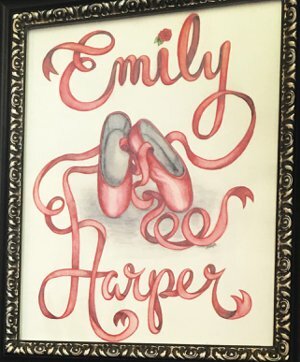 These beautiful paintings, the Emily Harper name print with ballet slippers, the ballerina bunny and beautiful floral letter "E" were all designed by her and painted by her hand with watercolors. They are an absolute treasure. Hand-made gifts from someone you love are just about the best gift you can receive in my opinion! Molly does primarily commissioned, custom work and can be contacted for orders on Facebook (click here to go to her shop) and you should definitely "like" her page so you can keep an eye on the great art she is constantly making! 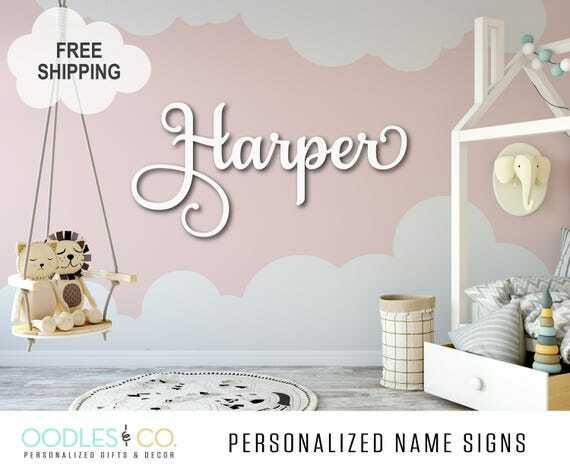 One of the highlights, the name sign above her crib came from the shop Oodles and Co which designs custom name signs like this one in a variety of fonts and finish options. White was the perfect color for this room to pop against the pink walls, yet still be a very soft and feminine touch. I can't believe how beautiful it turned out and what an accent it is to the room. I framed it on both sides with paper flowers that I found at a craft store- actually they were a part of a wreath I found at a craft store which I dismantled and painted the leaves navy so that they would coordinate with the Pink and Navy Color scheme. Of course Emily can't read yet, but I've told her enough times that it says Emily Harper that she knows and points to the sign saying "Emmy Hopper" when I put her to bed. I learned that pink and navy aren't a popular color combination for a nursery while I was searching for pink and navy crib sheets. It turned out to be quite a task, and after hours scouring all of the typical children's stores I started to think I should give up on this color scheme and go a different direction. Finally stumbling upon the etsy shop Thursday Afternoons Co was a stroke of luck, as she was able to make me exactly what I wanted, and actually had more than one option for custom fabrics that would fit the pink and navy nursery I had planned. This talented shop also sells a variety of other beautiful handmade baby items like bibs, hats and these beautiful bows you see on my Emily in this post. Speaking of bows, did you know that for a little girl there is no such thing as too many bows? 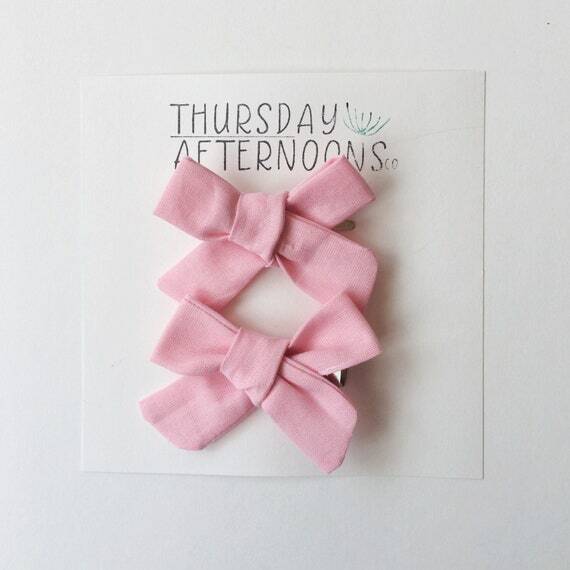 Of course, she needs simple solid colors, like these lovely clips from Thursday Afternoons which coordinate with any outfit, but she also needs a variety of different shapes, sizes and patterns! And if your girl is anything like mine, you'll need a half dozen at least of every kind because some will be lost when she pulls them from her hair and flings them from the stroller before you notice. I waited on putting all of her bows on this holder until after the photos because I'm not sure the world is ready to see just how many she really owns. Believe it or not, bow clutter had started to become a major annoyance in her room, with the little vases meant to contain them always seeming to have more bows on the outside than in. 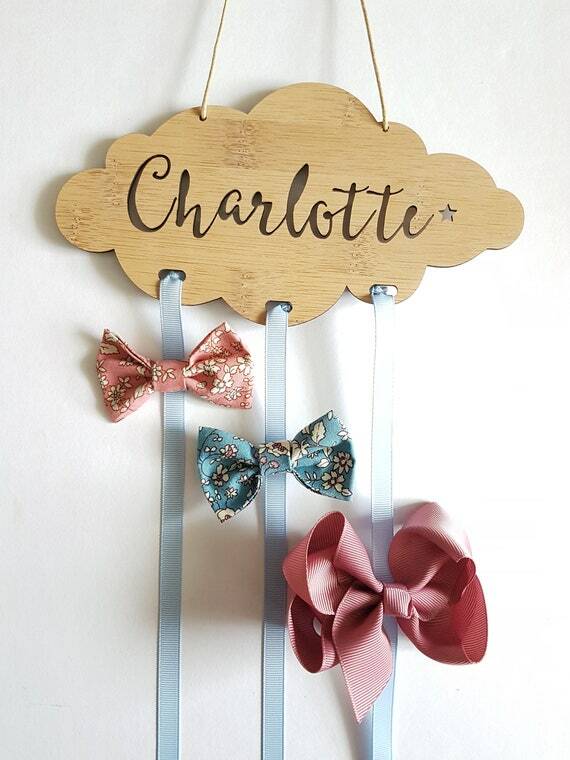 This little barrette holder by Little Birdy Finds was a great solution, but also a really sweet addition to her room. I love the natural wood which breathes a little bit of contrast from the pink and navy, and complements the natural colors in her rocking unicorn from Pottery Barn. Of course, there is so much more than just dressing her in girly outfits and giving her a princess room. I think most parents embrace the opportunity to relive the parts of their childhood that they loved. One of our favorite things to do together is to sit in her little teepee and read. Oh how my baby girl loves books! We could read for hours, and while our choice in books might not always be the same, she is just like me in this way. Her scrunchy nose smiles and squeals of joy as we turn pages pointing out animals and making their sounds bring out the kid in me, and I feel her laughter in my soul. 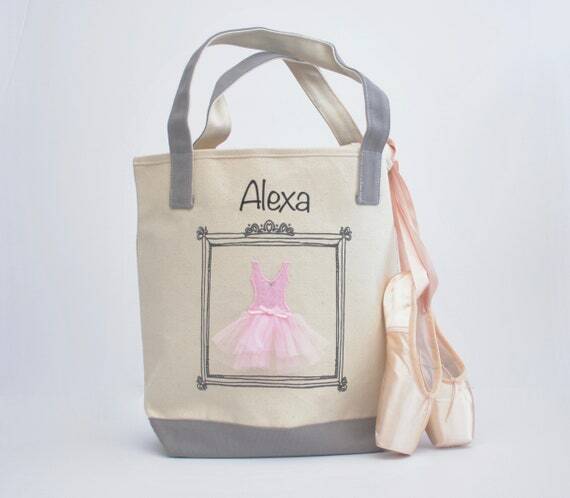 This lovely ballerina bag with a real tulle skirt has been a fixture in her room when it's not being used to tote books back and forth from the library. The pictures honestly didn't do it justice, so you'll have to check out the shop (click here) to see how pretty it is!